Environmental Molding Concepts (EMC) - An industry leading manufacturer of rubber flooring playground tiles and recycled rubber mats for flooring, landscape, roof protection and equestrian applications. 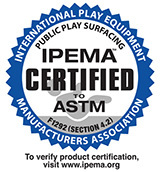 Professional grade rubber tiles from the industry leader with all the accessories you need for a complete safety surfacing solution under any playground. Beautify your patio with our recycled rubber paver tile flooring. Create beautiful and functional outdoor surfaces from recycled rubber paving tiles. Add style and protection to your workout room with these recycled rubber flooring tiles. Comfortable under foot and hoof. Protect your animals, protect your investment. 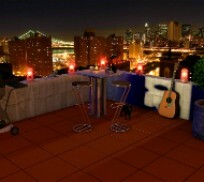 Capture premium outdoor space with these rubber roof deck protection tiles. Attractive floor protection for gyms and workout rooms that soften impact and provide great sound absorption. Glue down or floating floor applications. Protect your investment with our easy care, durable equestrian flooring. Tough enough to drive over but soft enough to cushion. Transform old concrete with the look of pavers. 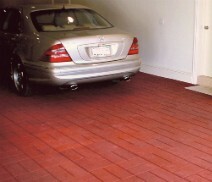 Available in a brick top or smooth finish, Paver Tiles provide a slip re-sistant surface wet or dry. Protect your roof membrane while capturing valuable outdoor living space with DeckTop. Engineered to last under 6 lbs/sf. EMC is an industry leading rubber flooring manufacturer located in Southern California. 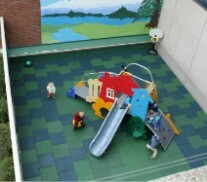 Our rubber flooring products include rubber mats such as yoga room and rubber gym flooring in our SportPlay line and playground tiles playground surfaces in our Kid Kushion line. We also offer horse stall mats for equestrian, ranch and barn applications in our EquiTile line as well as rubber pavers, rubber patio pavers and rubber garage flooring in our Paver Tile line. Our rubber flooring can be glued down to the sub-floor with our SureSTICK Adhesive. Rubber flooring expands and contracts with changes in temperature so it's always important to have perimeter containment around the installed rubber flooring to insure it stays in place. With more than 25 years experience recycling rubber and producing innovative products used in the home, business and community, you can count on EMC for all of your rubber flooring needs.